Ernst Huber was born in Vienna in 1895. His artistic talent was clear early on and the first exhibition of his pictures took place already in 1919. From there on, the self-taught artist was represented at many different exhibitions. From the very beginning, Ernst Huber possessed the artistic means of expression necessary for the way he wanted to present his work. A naive, simplistic representations of nature’s landscapes characterised his pictures. Encouraged by the abundance of all that he could see around him, Huber also reached for his watercolours in order to capture reality with their more versatile technique. In 1943, having lost his son in the war and after his flat in Vienna was bombed out, Huber was persuaded by his friend Karl Heinrich Waggerl to buy a house in Wagrain. The Hubers owned and lived in this old house until 1956, when they returned to Vienna. Ernst Huber travelled extensively and always brought back a large output of pictures from his trips. His pictures from southern countries and far off continents radiate with an impressionistic lightness, although his subjects always retained their own meaning. 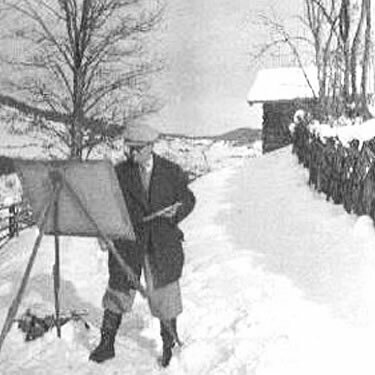 Many of his landscape pictures were created in his hometown, in the country and especially here in Wagrain. 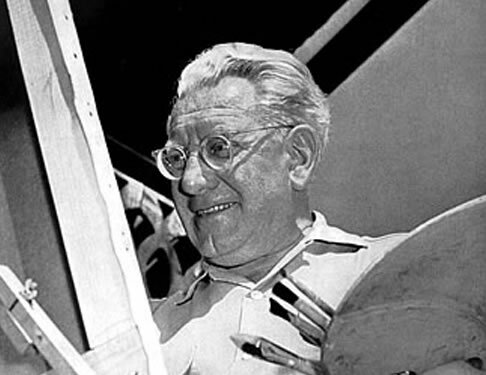 During all his years of creative work, watercolours and oil paintings were always the richest part of his artistic output. 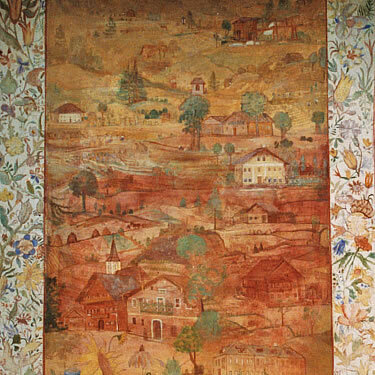 However, he had also mastered other techniques and that is how, at the beginning of the 1950s, he came to paint the fresco at the back of the Wagrain parish church. This was restored by Peter Mayer in 1999, at the request of the „Blaues Fenster“ cultural association.